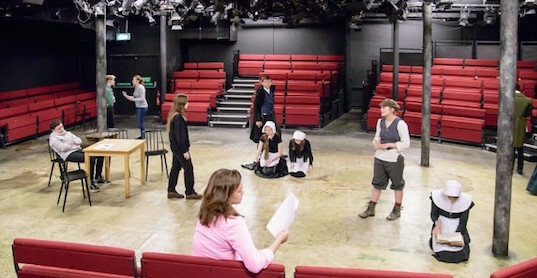 Image: stf Season Workshop students rehearsing in the Tobacco Factory Theatre with Education Facilitator Sophie Whittaker. Photo by Graham Burke. As our Bristol season moves to the autumn we are now offering new and exciting Saturday Morning Workshops. Workshops include acting techniques, ensemble work and devising an original script to be performed in the theatre. stf has built an Outreach/Education arm to augment the main company, giving students and faculties around the country a chance to experience our dynamic and enriching performing arts programme. Despite Shakespeare being the only compulsory writer left on the national curriculum, teachers are given little guidance as to the best method of dealing with his plays in the classroom. We can help to give the confidence, skills and support to engage in the practical teaching of his plays. 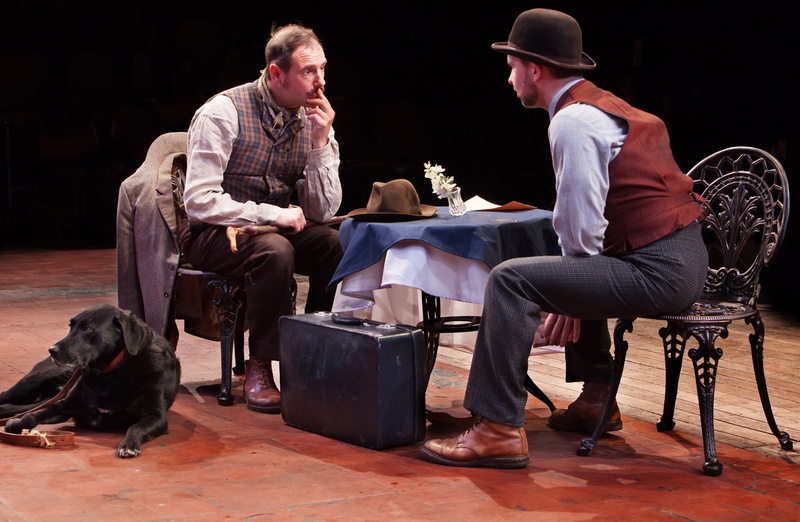 Image: Chris Donnelly and Marc Geoffrey in Two Gentlemen of Verona. Photo by Farrows Creative. Image: Students from Meadows Primary School with Education Facilitator Dan Winter. Photo by Natalie Dewan, Shakespeare Birthplace Trust. The company has worked closely with The Shakespeare Birthplace Trust as a launch partner for Shakespeare Week, an annual celebration of Shakespeare for primary school children throughout the UK. stf offer education workshops that are prearranged and held on-site at participating primary schools in Bristol. 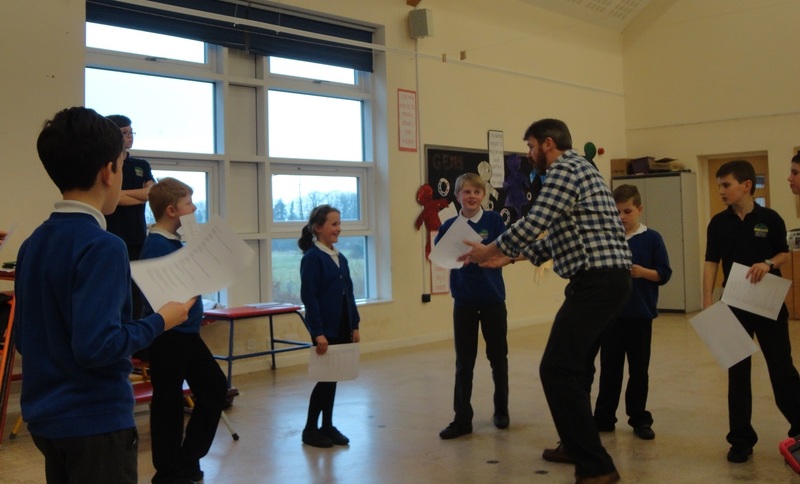 We launched our Shakespeare Week workshops in March 2014 with the theme Comedy and Magic, exploring magic and comedy capers of some of Shakespeare’s finest plays. In 2016 the theme was Friend and Foes exploring friendship and gang rivalry through the close relationships of Romeo and Juliet. In 2017 our theme was Men, Monsters and Magic where we looked at the supernatural and all other magical aspects in The Tempest. Our theme in 2018 was Blood, Battles and Betrayal exploring the disorder created from Macbeth’s repeated betrayal on those around him. This year we offer a mixture of Fairies & Magic and Betrayal, Blood and Battles with workshops around A Midsummer Night’s Dream and Macbeth. Watch a video taster of Shakespeare Week 2014. With thanks to children and staff at Holy Cross Primary School, Bristol. Meadows Primary School teacher, Abi Lethbridge whose Year 6 class took part in Shakespeare Week. We welcome your feedback, and look forward to receiving your comments on how you found our workshops. We are proud to be recognised as an Arts Award Supporter, for more information please click on the button below.